Woohoo we spotted an awesome Dempsters mail-in rebate! 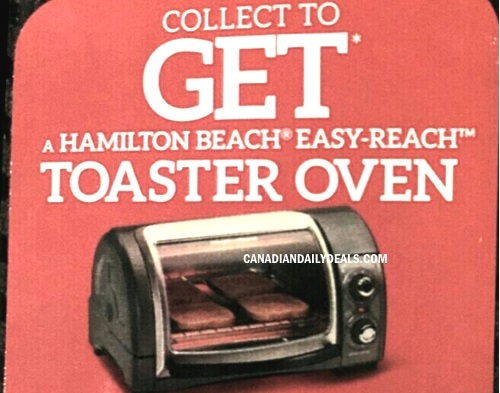 Get a Free Hamilton Beach Easy-Reach Toaster Oven when you send in 5 UPCs, recepts and $10 Shipping & Handling! Purchase five (5) Participating Products (see list below) between February 18 and March 24. 2016. Remove and keep the UPCs from the packages of the Participating Products and keep your original sales receipt(s). Then, on an 8 ½” x 11” piece of paper clearly print your first and last name, year and month of birth, complete mailing address (including postal code), daytime telephone number (including area code) and valid email address. Attach your original UPCs and original sales receipt(s) to your piece of paper and mail it in a single envelope bearing sufficient postage, along with a $10.00 CDN Money Order (do not send cheques or cash) payable to Canada Bread Toaster Oven Offer (for Shipping & Handling). Participating Products: Dempster’s 100% Whole Wheat Bread (UPC 68721002512) and Dempster’s Enriched White Bread (UPC 68721002222). Toaster ovens will be delivered to addresses in Ontario only. There is a limit of 1 Toaster Oven per household address. This offer is available February 18-March 24, 2016 but there are only 500 to go around so it you want this, I would send away right away!